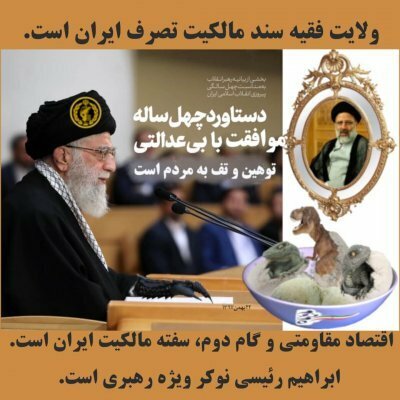 Chronicles from Iran » English » Economy » Agricultural Jihad: Strive for Amateurism! If there was a prize to win amateurism, then the Ministry of Agriculture Jihad, with its Agricultural Jihad would strive to obtain it. The economic orientation of the country needs to evolve from the ‘oil and rentier economy’ to ‘productive and popular economy.’ We must rid the economy of oil, and this important goal is achievable when considering the country’s facilities, capacities and manpower; just as some non-oil countries have achieved this goal. MUST باید is an Iranian favourite word in any domain by anyone,from the king to the beggar. As if by stating something MUST be done, it is going to happen miraculously. How to achieve a goal realistically is no concern to him. In Iran, encouraging the culture of exogenous water thirsty plants, hostile to the ecosystem, has produced short term (3-5 years) high yields. As the soil got poorer under intensive cultivation, drought and the water shortages destroyed the lands that might have remained productive if proper methods of cultivation were considered. Arable lands and fruit yards are slowly abandoned by their owners. They have become unproductive and desertification looms. If there was a prize to win amateurism, then the Ministry of Agriculture Jihad would strive to obtain it. When the Islamic revolution succeeded in overthrowing the Shah, and a herd of dogmatic hypocrites took power, Jihad was added to most ministries’ mottos and names. Jihad! Striving for excellence was to be seen in agriculture, in housing, in higher education… Thus, the Ministry of Agriculture changed its name to Agriculture Jihad. As if the incantation of the word Jihad would suffice to do miracles. It is a cultural knot; the Iranians love miracles, prayers and incantations to solve the most mundane and pragmatic problems for them. Jihad is to hammer in minds the progress. The catchphrase for farming, cattle growing and any other nature related activities is achieving self-sufficiency/خود کفایی. For ideological reasons, the Islamists who took the agricultural sector into their own hands were to wipe out the reforms undertaken in the 1960s. For almost fifteen years after the Revolution, the agricultural sector stayed exporting in some sectors, pistachios and cotton for example, whereas in others the harvest fast plummeted and importing them became a priority. Today, the agricultural sector is bankrupt, as is the case in all other economic sectors, including oil. 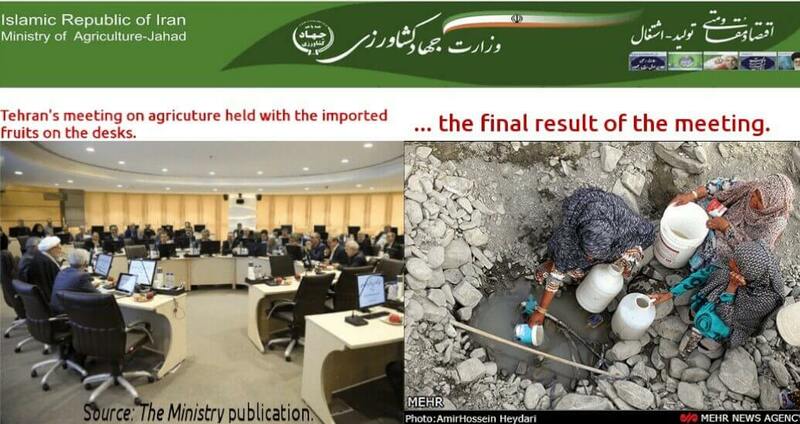 The demented and piecemeal development of agriculture in the past decades has made Iran more dependent, certainly not self-sufficient, on importing food and other farming products. The economy of a large country and its growing population, in the 21st century, can hardly be managed with the fourteen-century-old maxims uttered by crooked theologians and their ignorant cliques. Autarchy, self-sufficiency/خود کفایی, in any domain, is the narcissist fantasy of a dictatorship. There is a delicate equilibrium between farming and the long term use of arable lands in the arid and semi-arid areas. Recurring mistakes in cultivation break the equilibrium beyond repair. The slopes of the Zagros valleys and its plains were best suited to dry/دیمی cultivation. The plants grew in rainwater occasionally helped by the water pumped from the wells or a nearby stream. The harvests were appreciated for their quality. In the Ministry of Agriculture Jihad, a simplistic equation became the rule: the use of the more productive seeds, chemicals (fertilisers, pesticides) and more water would produce more to feed a soaring population. In theory. For the last two decades the farmers have been encouraged, by cheap seeds or other subsidies, to trade the indigenous seeds adapted to arid and semi-arid areas for the water thirsty cultivars. Hence, building dams became a sacred mission. The arable lands near the dams used thoughtlessly and unnecessarily the available water to grow colza, maize and unsuited cereal cultivars. Sadly, we cannot think of a more platitudinous, cliché-ridden sentence: Nature is always the human’s master. Neither the technology nor the religious beliefs can challenge it. As time went by, the top soils were ruined and water resources depleted. There is a saying: misery loves company. In the Zagros’ plains and valleys, the endogenous low-growing Quercus (oak) and thorny perennials (دِرِک) have taken over; adding a fire hazard as they burn like matchsticks in drought. Thousands of hectares burn every year with little hope of restoring them. Presently, most springs, streams, and rivers are canalised to serve reservoir dams, further drying areas downriver. The mirage of some artificial lakes, when filled, has given ideas to some opportunists: create rice paddies and trout aquafarming. As if a farmer in a fjord wanted to grow olive trees or vine. These examples are illustrations; for a near complete inventory of the damage in the country, volumes are needed. The high price of domestic rice in the country has encouraged anyone with access to water to cultivate it. The upmarket rice from the fields of northern Iran, Mazandaran for example, is by far not enough for domestic consumption and, even there, the production is falling fast. As the population has tripled in four decades, the demand for rice has grown proportionally. Tonnes of rice are imported or smuggled into the country. Rice cultivation needs an amazing amount of water, experience and particular skills in water management. Not all these conditions existed in Kermanshah Province. However, water, regardless of how it is collected, clean from mountains, pumped from wells, or even taken from untreated sewage water, was believed to be good enough to grow rice with. It took many years of culprit silence before the public questioned the health hazards stemming from untreated sewage being used to water the rice fields. In the meantime, the rice produced with unhealthy waste water was sold on the markets, and as it changed hands, it acquired a new and acceptable pedigree from the final consumer. The rice paddies were created from scratch in the arable lands of Sarpol-e Zahab County, using the water from reservoir dams. They were applauded as economic progress and encouraged. Today, the ecobalance of the progress is disastrous. Cubic metres of water have been depleted, the topsoil is an infertile layer of caked mud, and the flora and fauna have disappeared. At last, a couple of weeks back, the Deputy of the Protection and Exploitation of Kermanshah Regional Water Company took action to forbid rice cultivation in the Kermanshah province. For him the use of 20-30,000 cubic metres of water per hectare to produce sub-quality rice is unacceptable. Far too late for the dried wells, extinct springs and dead streams. Furthermore, he has no power even to forbid the use of water for it; it is just muscle flexing and if a couple of rice-growers are bothered, a baksheesh or two would settle the dispute. The rice paddies in Kermanshah are just a sketch of a more realistic, but saddening, picture of what can be seen all over the country. The foolishness of developing aquafarming was a shocking surprise to many Kermanshahis, usually ready for a laugh and a quip. The Kermanshah province is situated on a dry and high Zagros plateau, better suited to the grazing sheep than the swimming trout. But, right in the centre of a semi-arid and arid area with a challenging and complex geology, a local office for fisheries, شیلات, was created to promote the Economy of Resistance, so dear to the theocratic-bureaucrats, and the masses of pen-pushers between Tehran and Kermanshah. This bureau is part of the Ministry of Agriculture Jihad. The local practice of aquafarming is based on breeding fish in cages /پرورش ماهی در قفس, part and parcel of the Approved Economy of Resistance Strategies/ طرح‌های مصوب اقتصاد مقاومتی. Kermanshah fisheries website: a lazy one when it comes to reporting the fisheries activity output. This is all we know so far on the process. Mr Sanjabi, a local governor and a caricature of the Iranian civil servant, inefficient and bootlicker, boasts about 60 tonnes of trout were produced and 15 jobs created in 2016. We always take the figures given by the Iranian officials with a large pinch of salt, and this one is no exception. The Iranian administration doubles or divides by two or three the real numbers, if available, depending on how the officials want to present the case. Otherwise, they just make it up. While the trout is supposed to grow in its cage, the Gamasiab River, where fish and other aqua spices used to be present naturally, is drying and dying from the pesticides and fertilisers. 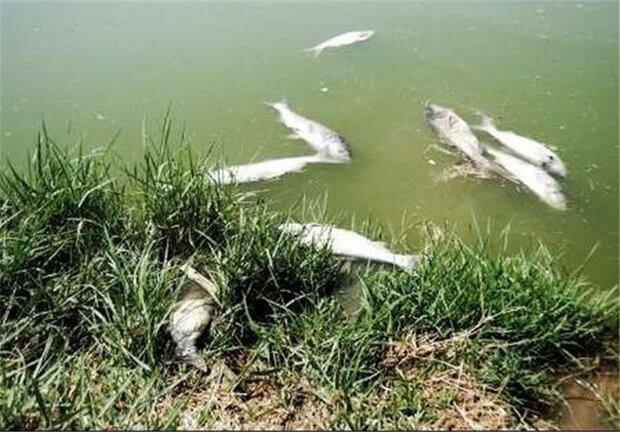 Shoals of dead fish on the banks or the ponds left on the riverbed are photographed. As years go by, there is less to photograph. The motto of the Ministry of Agriculture Jihad reads Resistance Economy, Production, Employment and Action. The Kermanshah civil servants for the fisheries have learned it by heart and do as they are told. They enjoy extracurricular activities that take up most of their office time. 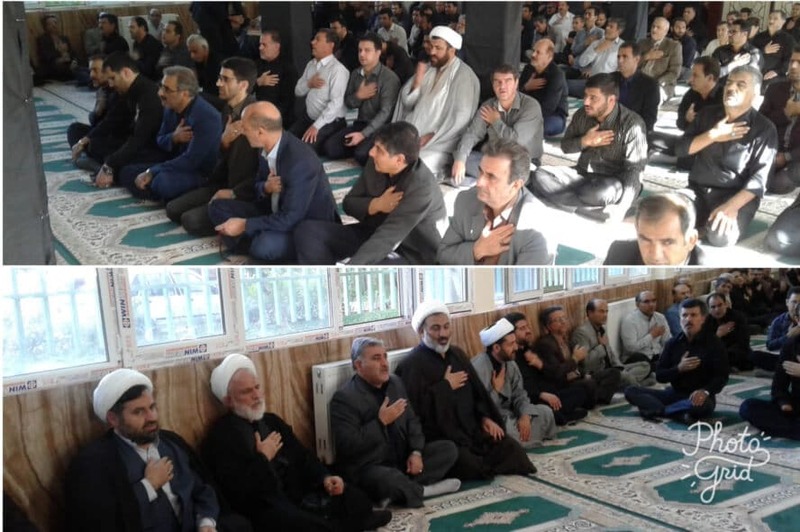 They are volunteers for the funeral ceremony of the martyrs’ graveyard dusting مراسم غبارروبی مزار شهدا or any other official ceremonies unrelated to fish, but more suited to a mosque. Kermanshah, the fisheries officials working hard for the theocracy. In the 1960s, Samad Behrangui wrote a book, beautifully illustrated, The Little Black Fish ماهی سیاه کوچولو. As a political allegory, it was banned in Iran. On a journey from his stream to the sea, the little fish held different political views. His early death was laid at the door of the regime. The political allegories are being repeated, albeit, nowadays, he would not have a chance of even growing up in the dying streams and polluted rivers. Kermanshah: as villages are abandoned in the province, the town grows.